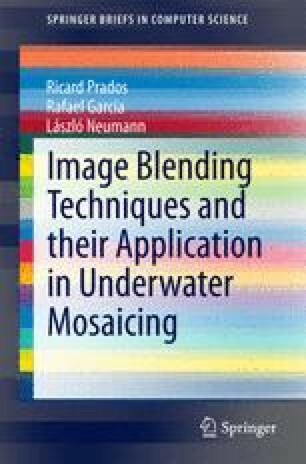 This chapter describes the full photo-mosaicing pipeline proposed in this monograph. This pipeline is intended to process datasets of thousands of images from large-scale underwater optical surveys. The first stages of the process involve the input sequence preprocessing, required to reduce artifacts such as the inhomogeneous lighting of the images, mainly due to the use of limited-power artificial light sources and the phenomenon of light attenuation and scattering. In this step, a context-dependent gradient based image enhancement is proposed, with allows equalizing the appearance of neighboring images when those have been acquired at different depths of with different exposure times. The pipeline follows with the selection of each image contribution to the final mosaic, based on different criteria, such as image quality and acquisition distance. Next, the optimal seam placement for all the images is found. A gradient blending, in a narrow region around the optimally found seam, is applied in order minimize the visibility of the joining regions, as well as to refine the appearance equalization along all the involved images. Finally, a novel strategy allowing to process giga-mosaics composed of tenths of thousands of images in conventional hardware is proposed. The technique divides the whole mosaic in tiles, processing them individually and seamlessly blending all of them again using a technique that requires low computational resources.